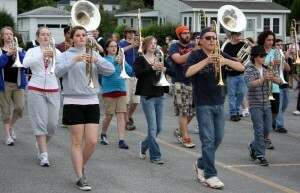 The Oswego High School Marching Buccaneers practice for the Fourth of July Parade. OSWEGO, NY – The Pride of Oswego – the Oswego High School Marching Buccaneers – will perform in Sunday’s Independence Parade. Under the direction of the Oswego School District Music teachers, one hundred new and seasoned marching band members have come together to continue the long tradition ofÂ traveling down Bridge Street in honor and celebration of the 4th of July. For more information about the Marching Buccaneers visit: www.oswegobands.org or visit them on Facebook.